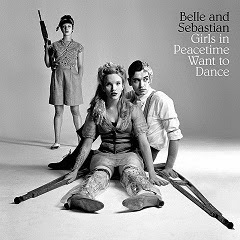 Glaswegian twee institution Belle and Sebastian are about to drop their ninth album, Girls in Peacetime Want to Dance, and the world will go on as usual afterwards. I’m pretty certain that there’s no obscure Mayan tablet that predicts that the release of this album will trigger global famine, pestilence, and/or disease. Nor will humanity as a whole achieve an elevated state of enlightenment through dishing out a few bucks for Stuart Murdoch & Co.’s newest recording. Indeed, what follows that fateful day, a mere week from now, will in all likelihood fall somewhere in between these two possibilities. Myself, I’m perhaps an oddity among B&S fans, in that my favourite album of theirs is not If You’re Feeling Sinister, but The Life Pursuit. I can tell you that Girls in Peacetime Want to Dance has neither the glorious pop glee of the latter, nor the beautiful handmade cynicism of the former. Yes, a band is allowed to explore new directions—in this case, over-produced, ‘80s-influenced, pop excess—but by no means is its fan base obliged to follow it down every new road. I can’t see any B&S fanatic drooling over Girls like they would Tigermilk. That said, the bongo-saturated “Perfect Couples” is a pretty great tune, a sort of hypothetical: what if Odelay!-era Beck covered Duran Duran?